Yes! This time, a serious hacktivism had been triggered by the Hacking group named "AnonSec" who made their presence in the cyber universe by previous NASA Hacks. The hacking group has released a self-published paper named "Zine" that explains the magnitude of the major network breach that compromised NASA systems and their motives behind the leak. The original cyber attack against NASA was not initially planned by AnonSec Members, but the attack went insidious soon after the Gozi Virus Spread that affected millions of systems a year ago. After purchasing an "initial foothold" in 2013 from a hacker with the knowledge of NASA Servers, AnonSec group of hackers claimed to pentested the NASA network to figure out how many systems are penetrable, the group told InfoWar. Bruteforcing Admin's SSH Password only took 0.32 seconds due to the weak password policy, and the group gained further indoor access that allowed it to grab more login information with a hidden packet sniffing tool. They also claimed to infiltrate successfully into the Goddard Space Flight Center, the Glenn Research Center, and the Dryden Research Center. 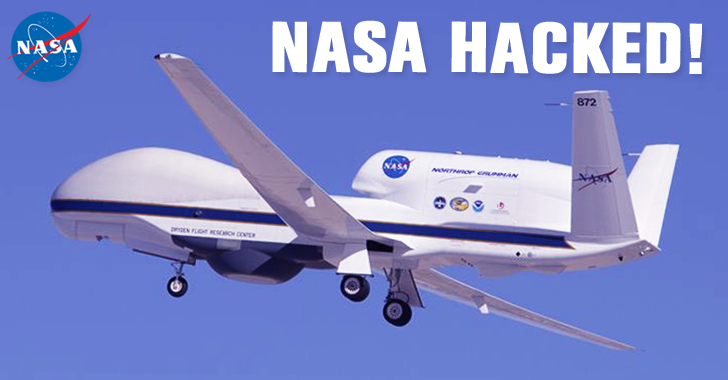 Hacking Global Hawk Drones, specialized in Surveillance Operations. …the sudden notification of a security glitch in the unusual flight plan made the NASA engineers to take the control manually that saved their $222.7 Million drone from drowning in the ocean. This hacking attempt had happened due to the trivial routine of drone operators of uploading the drone flight paths for the next fly, soon after a drone session ends. After this final episode, AnonSec lost their control over the compromised NASA servers and everything was set to normal by NASA engineers as before. This marked the attack's magnitude at a steep height by infecting into other pipelines of NASA, leading to this nasty situation. However, in a statement emailed to Forbes, NASA has denied alleged hacking incident, says leaked information could be part of freely available datasets, and there is no proof that a drone was hijacked. Why Did AnonSec Hack into NASA? "One of the main purposes of the Operation was to bring awareness to the reality of Chemtrails/CloudSeeding/Geoengineering/Weather Modification, whatever you want to call it, they all represent the same thing." "NASA even has several missions dedicated to studying Aerosols and their affects (sic) on the environment and weather, so we targeted their systems." Cloud seeding: A weather alteration method that uses silver iodide to create precipitation in clouds which results to cause more rainfall to fight carbon emission which ultimately manipulates the nature. Geoengineering: Geoengineering aims to tackle climate change by removing CO2 from the air or limiting the sunlight reaching the planet. Similar projects are running on behalf of the US Government such as Operation Icebridge [OIB], Aerosol-Cloud-Ecosystem (ACE) which are dedicated to climate modeling. This security breach would be a black label for the Security Advisory Team of NASA and became a warning bell to beef up the security.